Love will literally be in the air this Valentine’s Day weekend in Whistler with Superfly Zipline’s special Evening Dinner Tour. While the tour is available throughout the winter, Superfly will be kicking it up a notch this Valentine’s Day for couples looking to take their love to new heights. 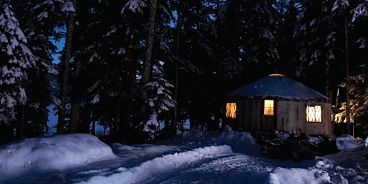 Romantic touches will be added to the regular tour that includes a heated snowcat ride, zipline through the dark and gourmet dinner prepared by the Bearfoot Bistro. The evening of romance starts with roses for the ladies and a heated snowcat ride up Rainbow Mountain followed a gourmet dining experience in a mountain top yurt. Catered by the renowned Bearfoot Bistro, couples will enjoy their dinner featuring a menu that includes fresh oysters, Slow Braised Angus Beef and a seductive chocolate-inspired dessert – all this while being serenaded to by live music. After dinner, the magic begins. Soaring through the dark under a starlit sky from platform to platform, lovers will be treated to an unforgettable zipline tour sure to get the heart thumping. To cap off the evening, couples will receive a complimentary photo to commemorate the special occasion. The 4-hour round-trip tour departs at 5:00 pm and 6:00 pm, and is priced at $199 per person. At over a kilometre long each, and reaching speeds of up to 100 km/h, with heights of 600 feet above the forest floor, Superfly’s two new tandem ziplines are the longest in Canada, travelling between two separate mountains. Riders are immersed in larger than life views of Wedge Mountain and the stunning Coast Mountain Range, with real wilderness under foot. Superfly is part of the The Adventure Group, a Whistler-based company that offers and packages the best activities Whistler has to experience. For more information or to book your flight call Superfly at 604.932.0647 or www.superflyziplines.com.